Does memorial honor the men or the cause? The Confederate memorial in downtown Lenoir was erected in May 1910, though originally it sat at the middle of the intersection of Main Street and West Avenue. It was paid for by the local chapter of the United Daughters of the Confederacy. 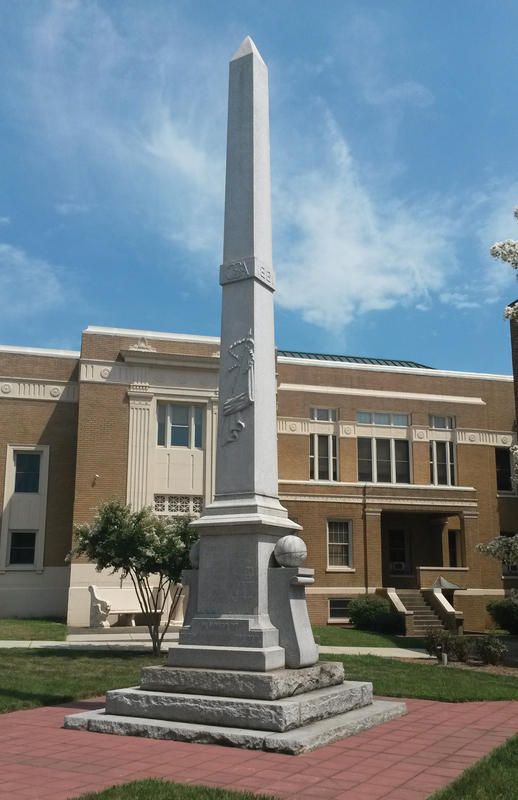 No version of the Confederate flag appears on the memorial obelisk that the United Daughters of the Confederacy paid to have erected at downtown Lenoir’s main intersection in May 1910. In many ways, it resembles a cemetery memorial. Near the top on the side facing the intersection are the letters CSA, for Confederate States of America, above a bas relief image of a cloth or shroud similar to depictions on many decorative headstones from the early 20th century, and on either side are 1861 and 1865, the short-lived nation’s year of birth and year of death. On the back of the base are listed the regiments where men from Caldwell County served, and below that is “Erected by the Vance Chapter of the United Daughters of the Confederacy of Caldwell County, N.C. May 1910” — the only place where either “Confederate” or “Confederacy” appears. The obelisk is surrounded by a flat lawn and hidden a bit from West Avenue by a row of crape myrtles. It is a small but park-like setting, quiet, spartan and even a bit funereal. Directly south of that is Lenoir’s veterans memorial, which has a larger obelisk, an eternal flame within a sleek, dark pyramid, the flags of all services with a plaque at the base of each, the state and U.S. flags, and pavers with individual names. This corner commands attention, calling passersby to investigate, and yet it is solumn and stately. It is not just a memorial marker but a tribute to all the generations who helped ensure the survival of the United States of America. In that context, the Confederate memorial had always struck me as a historical marker honoring the dead, not celebrating the cause for which they fought. Whatever their beliefs or motivation, these were fathers, sons, brothers and neighbors. They had lives before the battlefield, and that is the loss the monument mourns. I surmised she meant that, in light of the sharp shift of attitudes against the Confederate battle flag since the shootings in Charleston, S.C., all things Confederate may be considered suspect. I told her that no one to my knowledge had raised the suggestion, that since there is no depiction of the “Stars and Bars” on the monument I had not made a connection with the flag controversy, and that the monument is an obelisk, not a statue depicting a soldier defiantly standing ready to fight, as exist in many other towns. She then insisted that, yes, the memorial actually is connected to the controversy “because the word Confederate is on it,” and she launched into an explanation of why, “soon,” people “all across the state” will be calling for such monuments to be removed. Without pausing, she said she would put my response “in my paper. Thank you,” and hung up. I reeled a bit. “My paper”? Had I just been the victim of drive-by advocacy journalism? Or was she writing a research paper on the topic as an academic exercise? I suppose I’ll find out sooner or later, Google help me. I didn’t stay to watch the old Smith family home at the corner of Abington Road and Harper Avenue burn all the way to the ground. But it was long enough to be reminded that in fire, beauty and horror are siblings. This is especially true when an old house like this one burns. The house was a two-story, brick American Foursquare, an architectural style that was especially popular in the early 20th century. It was built in the 1930s. A firefighter on the scene said some of the interior walls and ceilings were beadboard. I would imagine the interior woodwork remained a sight to behold right up to when the flames touched it, even if the view out the front door had changed significantly since the 1930s, where what must have once been a quiet, two-lane road now is a four-lane bypass. As someone put it in an understated comment on a Facebook photo of the fire, the house looked like it had a lot of potential. Unfortunately, the lot it sits on also has a lot of potential, but not for single-family uses such as that house. The developers who bought it plan to begin work in July to build a three-story apartment complex intended for low-income adults over 55. The house’s footprint is where one end of the L-shaped building will be, said Roy Helm, president of Wesley Community Development, a Methodist-based company that is planning the apartments together with the Western North Carolina Housing Partnership. The developers let firefighters use the house for training. Battalion Chief Ken Nelson of the Lenoir Fire Department said that nine teams of firefighters from Lenoir, Hudson and Gamewell each had at least two training sessions finding and fighting fires that were set inside the house. 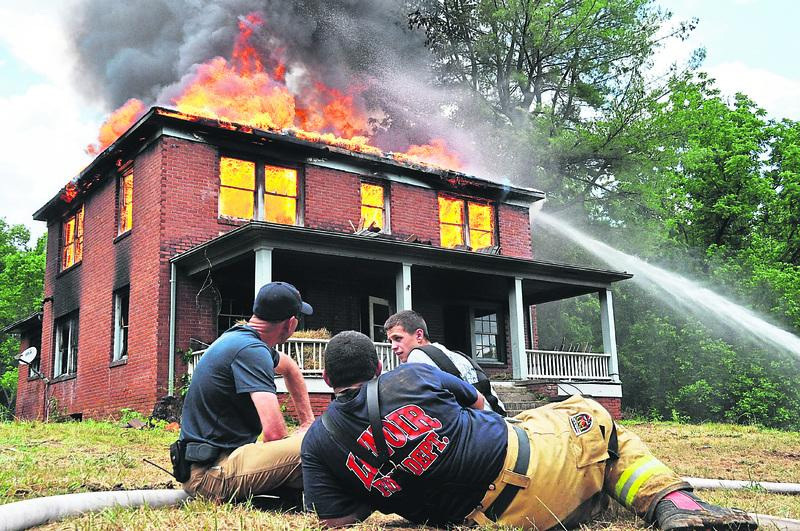 A two-story house like this one is especially valuable for training, Nelson said, because fire behaves differently where there are stairs, which act like a chimney. Fire creates its own weather, and the structure of a house influences it. Firefighters need to be able to see how fire behaves in different kinds of structures. By about noon, after setting and putting out 20 or more fires, the firefighters set the final one, then stepped back. Eventually I had to step back too. I kept stepping back. Once the flames burned through the roof, the heat emanating into the front yard — even against the wind — felt uncomfortably hot. I wondered whether the lenses in my glasses would warp, even as I watched Chief Ken Briscoe, wearing glasses, stand his ground 20 feet closer than I was. Many of the firefighters, standing in T-shirts, remained closer to the fire than I could bear. Perhaps that’s good training too. They get used to the heat. One things I’m not sure I could get used to is the burning. That beautiful wood, those stately bricks, that old, crinkled glass. The things that would evoke memories and provoke stories from those who grew up here. In a couple of months, even the ashes will be gone.